Marvel, you done fucked-up again. No, I'm not talking about how the company refuses to quit trying to shove the Inhumans down our throats, this is even more moronic than the beating of that dead horse. 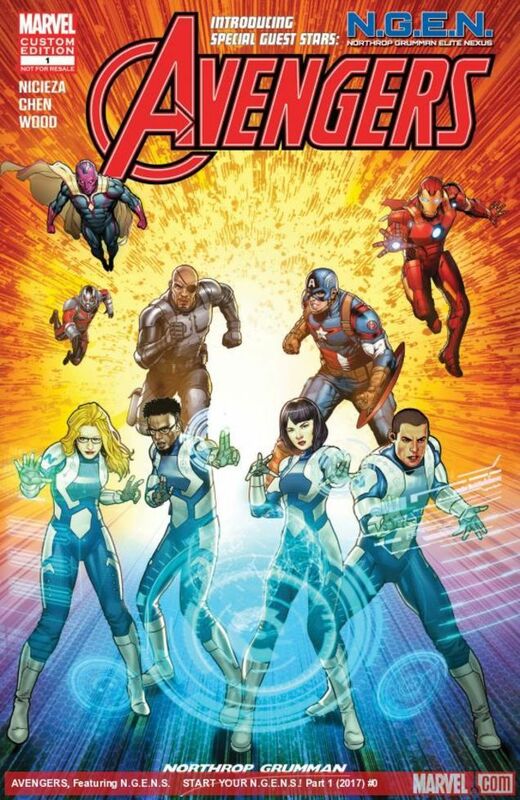 Now, as we all know Marvel will team-up with random companies sometimes (and has been doing so for a quite awhile) to promote everything from Hostess snacks to health insurance. This can mean Marvel characters appearing in television, internet, or print ads, and sometimes Marvel will even have a full-on comic that advertises a campaign, company, or product--remember when various Marvel heroes fought against cigarettes and the villainous, "Smokescreen?" Seriously, does anyone remember that? It is clear Marvel likes to partner with other companies to make money/raise awareness of issues/slowly take over all media as an arm of Disney's empire, but there is one recent partnership that raised eyebrows and a lot of ire--Marvel partnered with a company that basically makes money from selling wares of death. 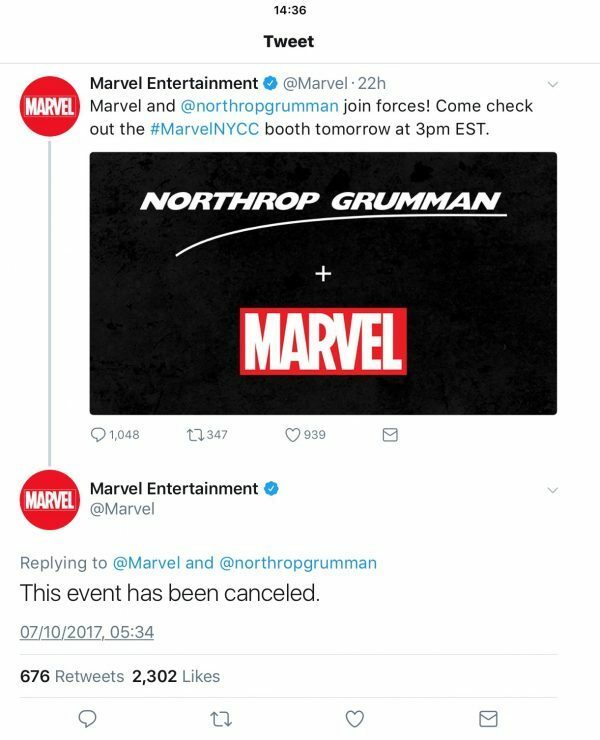 I hadn't ever heard of Northrop Grumman, but apparently they are one of the largest arms-makers around, making billions on stuff like parts for Nuclear ICBMs, you know like anyone who would partner with a comic-book company does. They had a sponsorship deal with Marvel that featured a free comic where the company's superheroes teamed-up with some scientists at Northrop Grumman to fight villains, with there being some rich irony considering the heroes are working with a folk from a company that literally sells weapons of mass destruction. The idea was to promote learning science and math, Marvel claims, and also they didn't know what the sponsorship department was doing so somehow that removes any blame from the main company in this case of the left-hand needing to meet the right-hand; clearly Marvel is missing the point that it's all attached to the same metaphorical body so maybe taking some actual responsibility and just admitting this was a big mistake would be wise (that won't happen though). As soon as people realized what Northrop Grumman was and expressed concerns to Marvel about how this was a bad look, a previously-announced panel at NYCC got itself promptly cancelled, all links to the digital comic promoting the partnership were shut-down, and I assume any physical copies of the comic were burned in a mad-panic with any that possibly escaped destruction now suddenly to become sought-after rarities. The usual bickering between people who don't think this was a big deal, people who are mad this happened in the first place, and other people just curious how to even pronounce, "Northrop Grumman," has been taking place on the good ol' Twitter and I would encourage you to not bother to look it up because when has reading Tweets ever changed your mind on an issue as opposed to just making you further entrenched in your viewpoint and enraged at all hateful people in the world? Yeah, exactly. I personally don't care if Marvel wants to partner with a private company that makes weapons, they are a business and can work with any other business they want. The optics of it just don't look that great to so many people you would have thought in this era of strong opinions and even stronger (and louder) expressing of said opinions that someone would have thought this through. Considering the rough time Marvel has been having with, "Secret Empire," failing in an epic manner and, "Legacy," failing to excite basically anyone this was probably the last thing they needed. Therefore--as I already said--Marvel, you done fucked-up again. Plus, NYCC isn't even over--it just now is past Midnight on Sunday--Marvel has one more day to do something even more horrifically stupid if they want. Time will tell. I Have a Moon Knight Funko Now!